Dr David Sanderson led and coordinated a series of projects to develop reliable methods for the detection of irradiated food, an issue of strong societal concern. He was a pioneer of developing and applying a cascade of luminescence methods, based on the way radiation interacts with matter. The first demonstration of the use of Thermoluminescence (TL) to detect irradiated potatoes took place on 27th October 1986 in East Kilbride, reproduced again the following day in front of a Chief Scientist from the Ministry of Agriculture. The resulting research which confirmed the validity of TL methods based on careful mineral separations, led to European interlaboratory trials and adoption in 1992 as the first reliable official method for detecting irradiated food; later extended to a European standard (EN1788) and then adopted as a world standard by the Codex Alimentarius Commission. Sanderson also devised methods for rapid screening of foods based on anti-Stokes photostimulated luminescence (PSL), which use single-photon counting methods to detect signals from inorganic phases without the need for time consuming laboratory extractions to remove organic material. This has also been adopted as international standard method (EN13751). "consumers are entitled to their right of choice in the consumption of irradiated versus un-irradiated food. 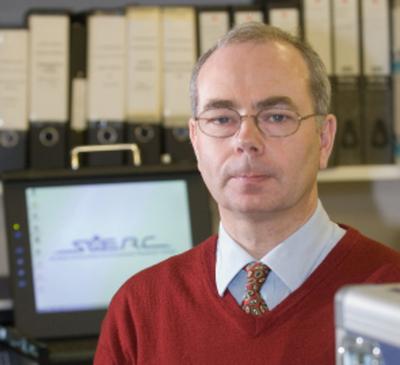 His design for a dedicated luminescence detector was patented through Glasgow University in 1993 and has sold steadily around the world for many years, with more than 150 laboratories currently using the SUERC instrument, and many overseas groups coming to Scotland for training. Together the TL and PSL methods are routinely used for most commercial and forensic certification work in support of national and international food irradiation regulations. Sanderson, D. C. W. and others. 1989. Detection of irradiated food. Nature. 340: 23-24. World Changing Project, "Developing robust methods for the detection of irradiated food," in University of Glasgow World Changing (University of Glasgow, 2010); http://www.worldchanging.glasgow.ac.uk/article/?id=66 (accessed April 26, 2019). World Changing Project. "Developing robust methods for the detection of irradiated food." In University of Glasgow World Changing. University of Glasgow, 2010. http://www.worldchanging.glasgow.ac.uk/article/?id=66 (accessed April 26, 2019). World Changing Project. "Developing robust methods for the detection of irradiated food." University of Glasgow World Changing. University of Glasgow, 2010. 26 April 2019 <http://www.worldchanging.glasgow.ac.uk/article/?id=66>.